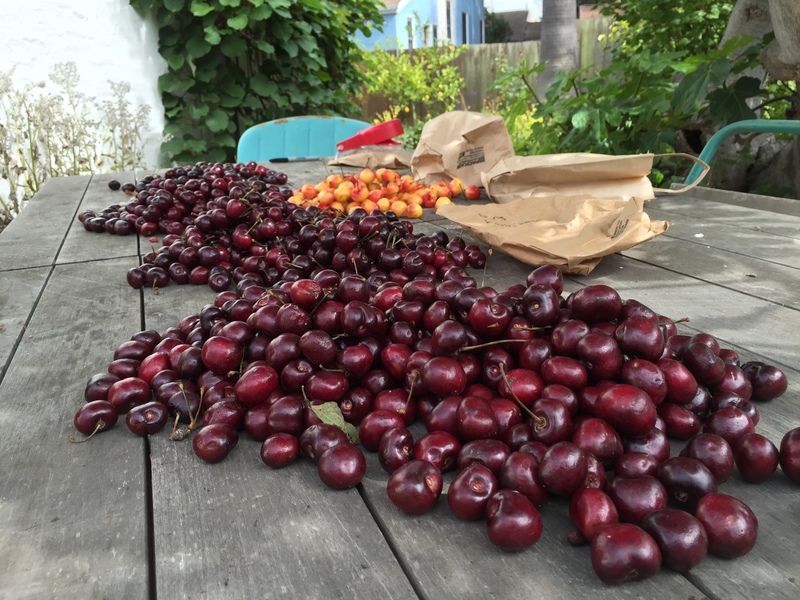 Macerating some of them in sugar in preparation for shrubs. 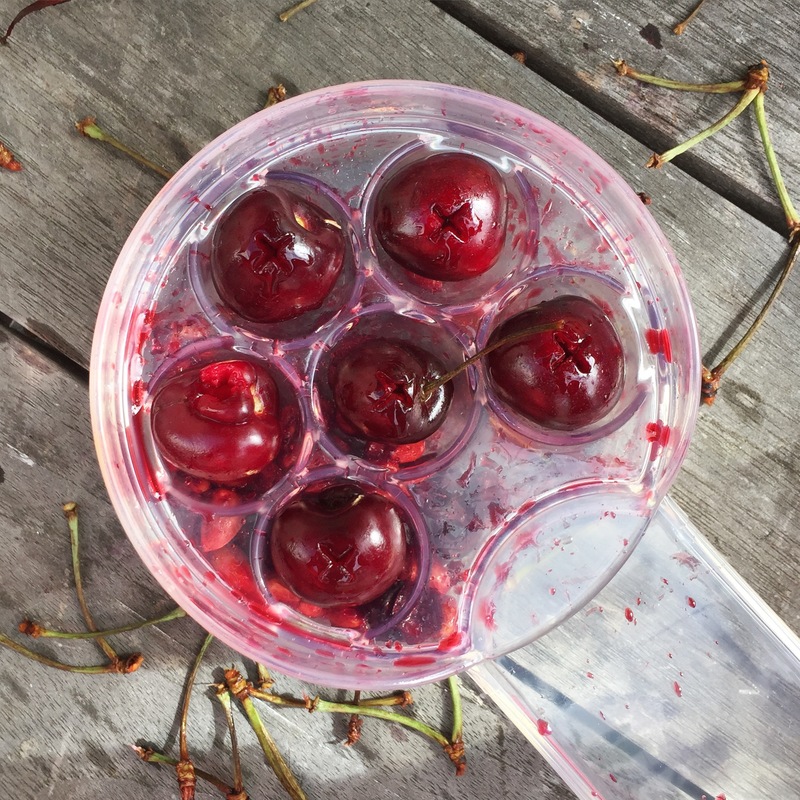 Coming across unusual, briefly-in-season, quick-spoiling fruit at Monterey Market yet again inspires cold-infused shrubs to extend the experience. 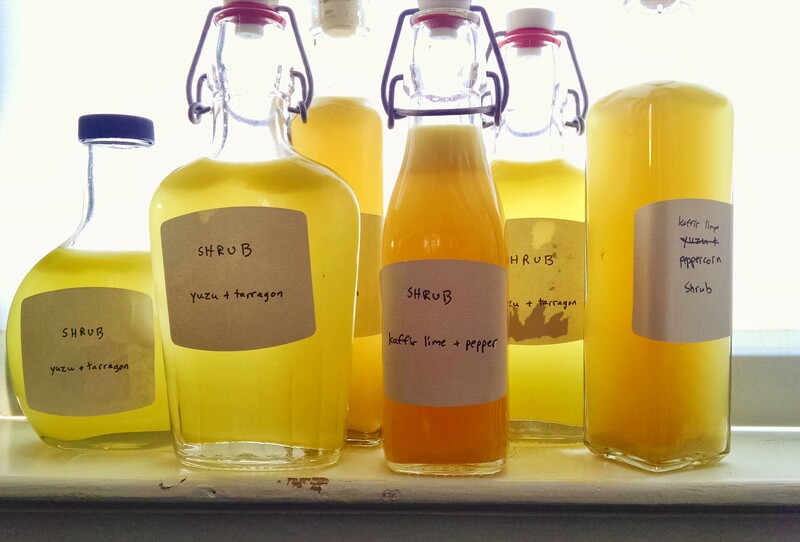 Shrubs (drinking vinegars) are one of my favorite ways to preserve fruit — it goes a long way, it’s shelf stable even at room temperature, and it works as an addition to sparkling water, in salad dressing, or in a cocktail. 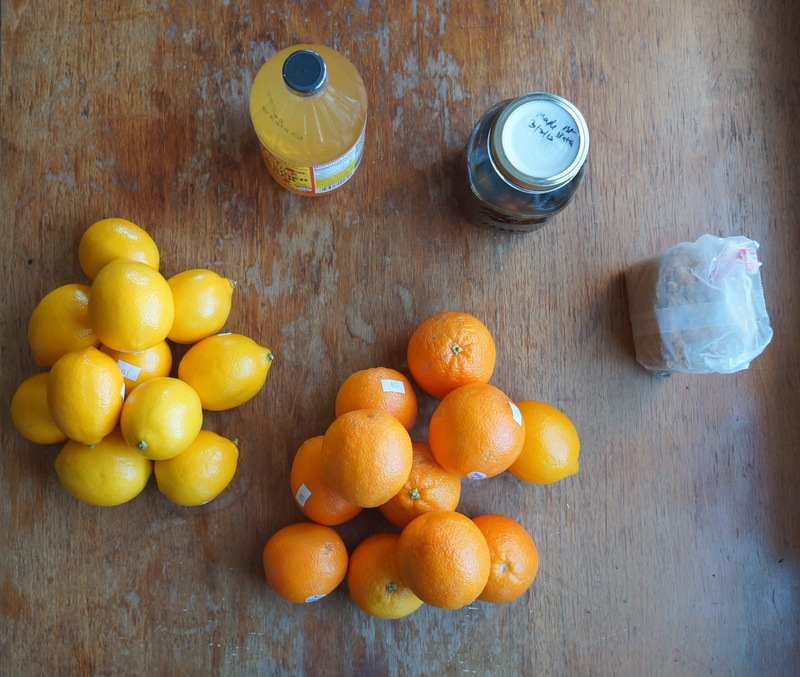 Between holiday gifts and internal consumption (especially since I bought a Sodastream), the citrus shrubs from April and December were mostly gone. Fortunately, a trip to Swanton Berry Farm (pick-your-own) resulted in a box of small, flavorful, moderately-overripe-and-turning-to-paste-under-their-own-weight strawberries. After last year’s enjoyable experience making shrubs (a shelf-stable way to preserve fruit with vinegar and sugar, for mixing into soda water, cocktails, salad dressings, and so on), I’ve spent a few more weekends trying new citrus, new vinegars, and different ratios, as well as using oleo saccharums (citrus oils extracted from the peel with sugar: I posted some photos of the process yesterday). 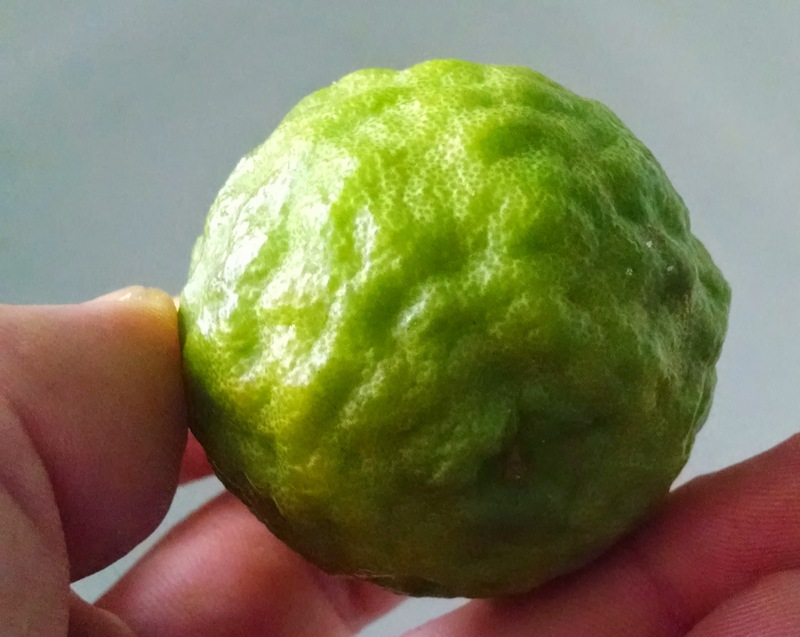 Since much of the unique flavor of bergamot is in the zest, an oleo saccharum is key. 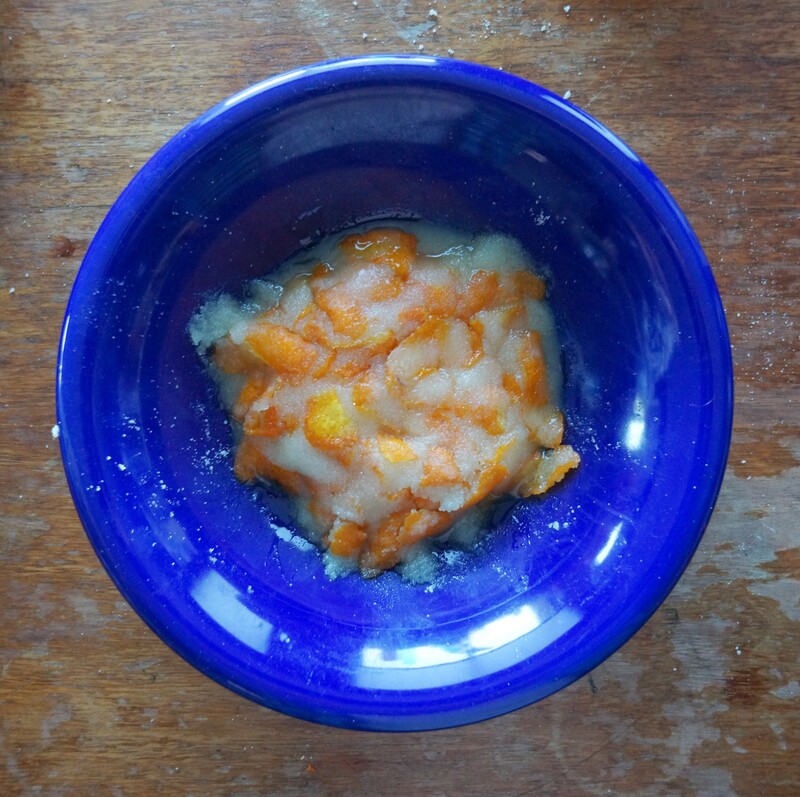 I combined the peel of four bergamots with 2/3 cups of white sugar (let sit and periodically kneaded for about 10 hours, see photos)– by the end of that time I could smell it even through the bag. I added that to the juice of 17 bergamots (about 2 cups), another 1 1/3 cups white sugar, and, by trial and error, 3/4 cups of my favorite cider vinegar (Bragg). 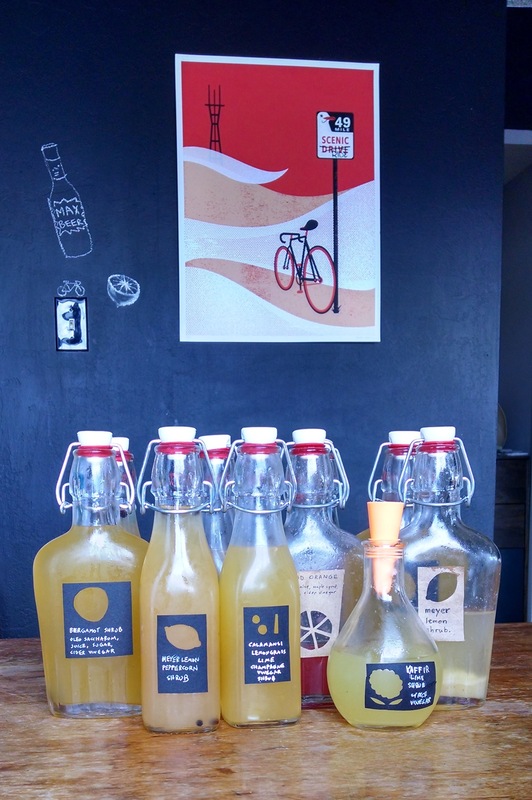 The vinegar flavor was a little overpowering, initially, but it’s supposed to mellow over time… and indeed, after sitting for a week it’s become one of my favorite shrubs– one spoonful livens up a glass of sparkling water. 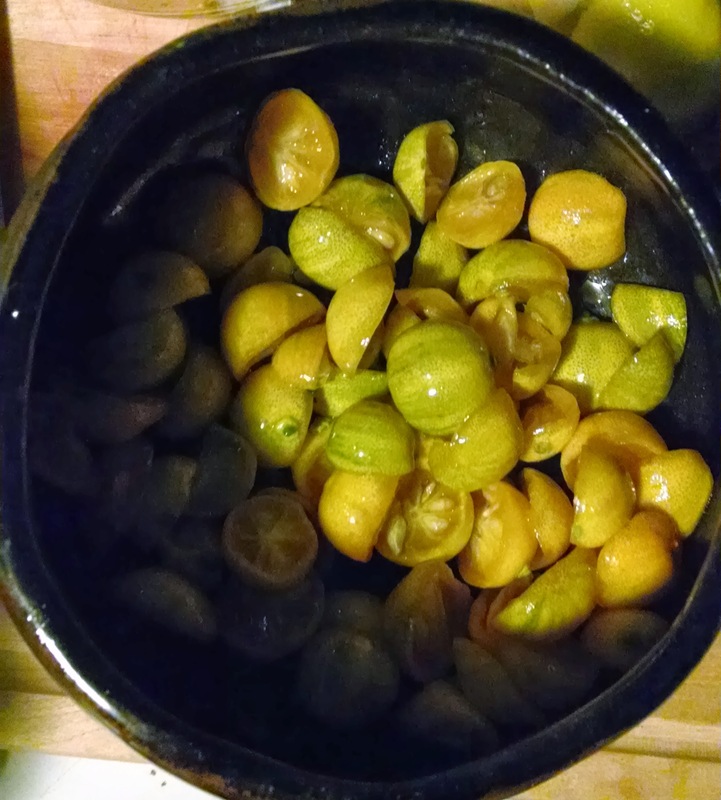 I’d been brought a gift of fresh kaffir limes (which I’d never seen before), just on the edge of turning brown, and knew immediately I wanted to preserve their flavor with a shrub. The peel has the same distinctive scent as kaffir lime leaves, a dry, spicy, and floral citrus. 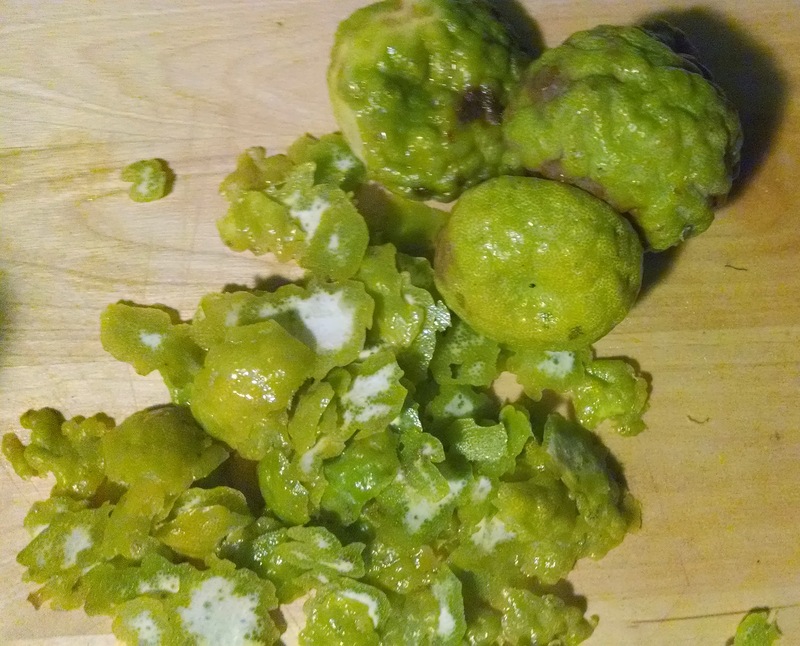 Since they’re so knobby, they were a huge pain to peel– normal peelers or zesters were useless, so I used a small knife and painstakingly trimmed off rind and then removed pith… ending up with the peel of 15 kaffir limes packed in 1/2 cup sugar to make an oleo saccharum, plus the juice of the limes (only half a cup, quite dry), and almost 1/2 cup of a very mild neutral rice vinegar. This gave me a dry, perfume-like shrub that’s great to splash into water or champagne. 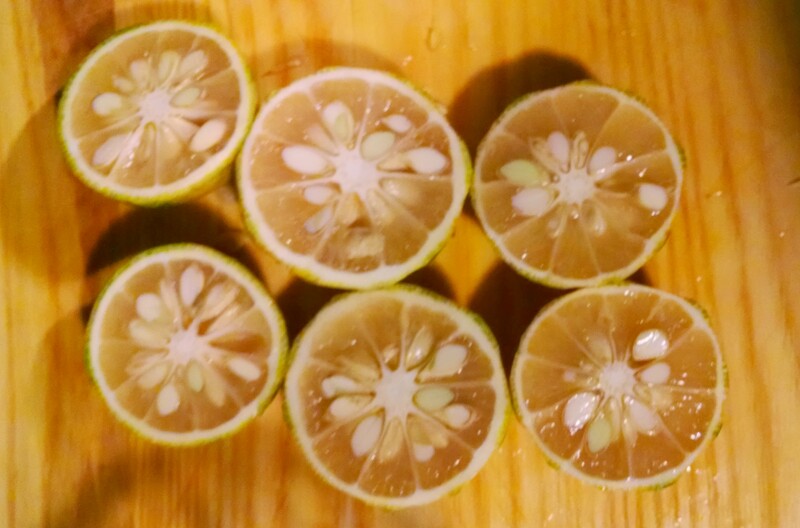 I don’t have the exact proportions written down, but this excellent shrub (probably my favorite basic citrus shrub) combined tiny calamansi (which I just sliced in half and packed in sugar, extracting both oleo saccharum and juice), additional lime juice, half a stalk of finely-sliced lemongrass, sugar, and champagne vinegar. 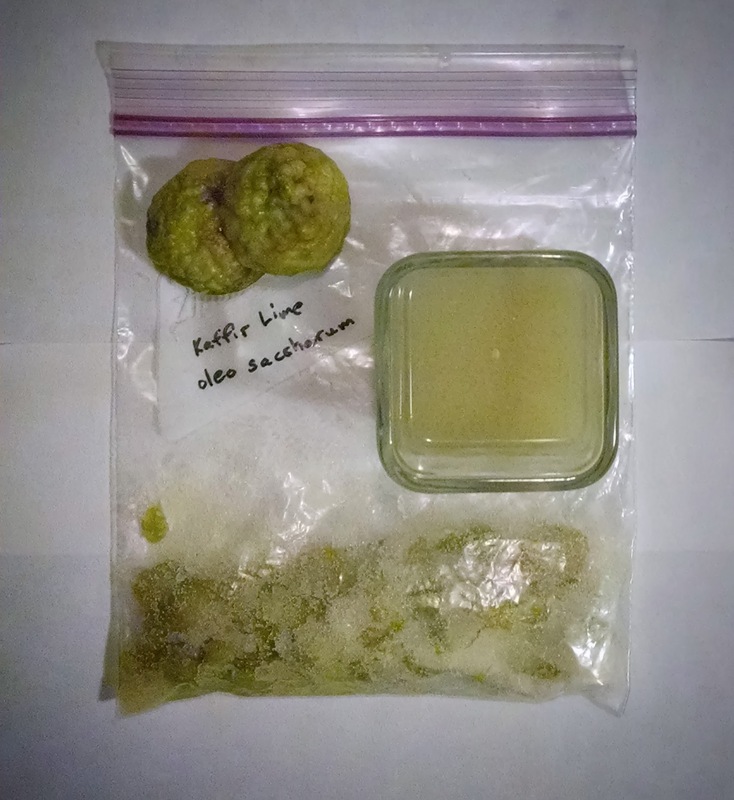 The peel of 9 meyer lemons in ⅔ cup sugar, the juice of 18 (about 2 cups), another 1 ⅓ cups sugar, mint leaves, black peppercorns, and a mix of cider and white vinegars. Easy. A shrub (a.k.a. 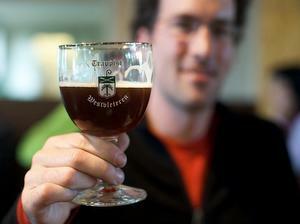 “drinking vinegar”) is a mixture of fruit, sugar and vinegar. It was popular in Colonial America as it was a way to easily preserve fruit pre-refrigeration, and has enjoyed a resurgence in the past few years as a non-alcoholic apertif or as an element in cocktails. 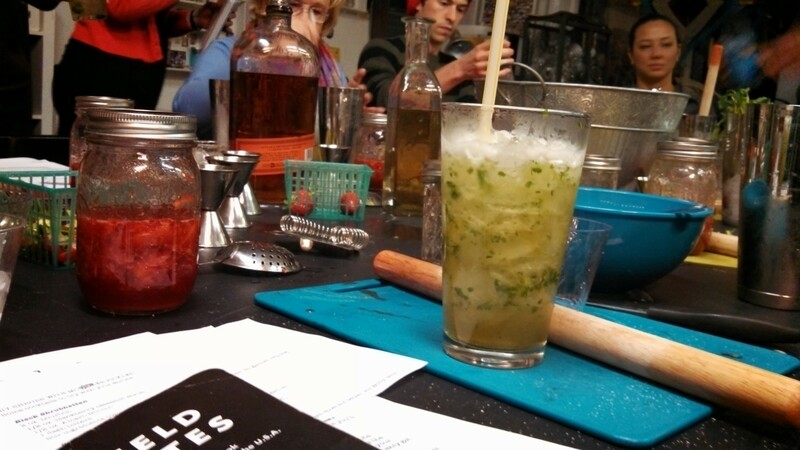 I was first exposed to one a few years ago at the Whiskey Soda Lounge in Portland, OR, and loved the tart/acidic flavor, but didn’t realize it was part of a broader movement. 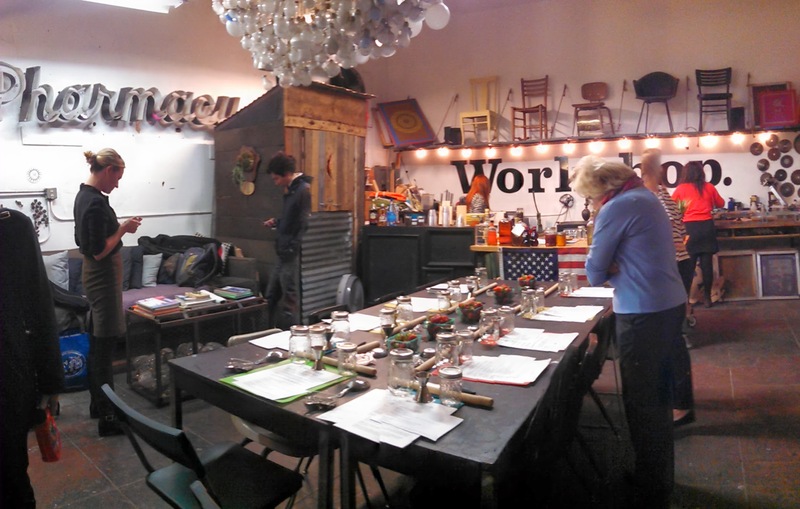 Fast forward to this fall and I got a shrubs and cocktail syrups lesson from Kelly McVicker , at Workshop, and then over the holidays made two more batches. 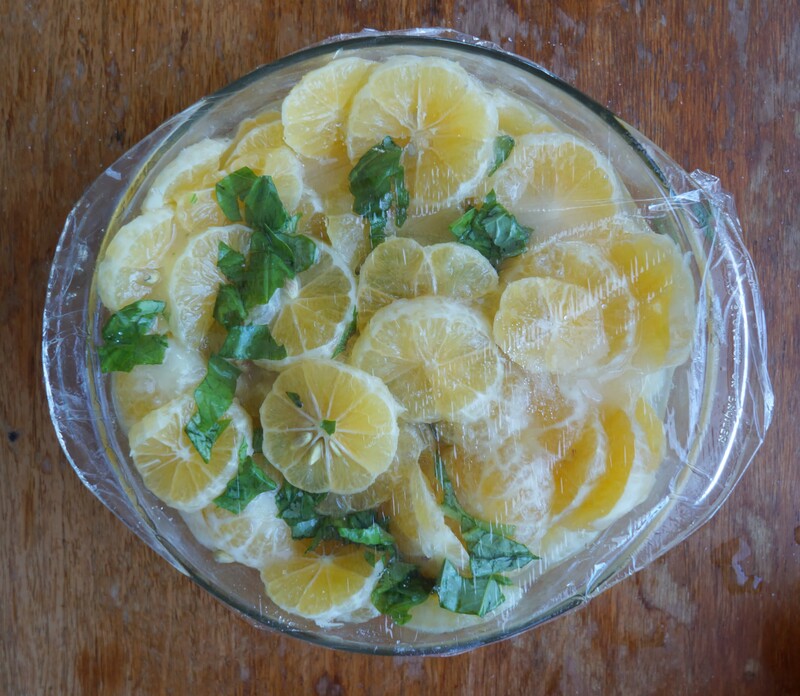 Macerating the sliced lemons in sugar along with basil, straining, then adding a mix of cider and white vinegars. I let the fruit macerate for four hours but could have given it a day. 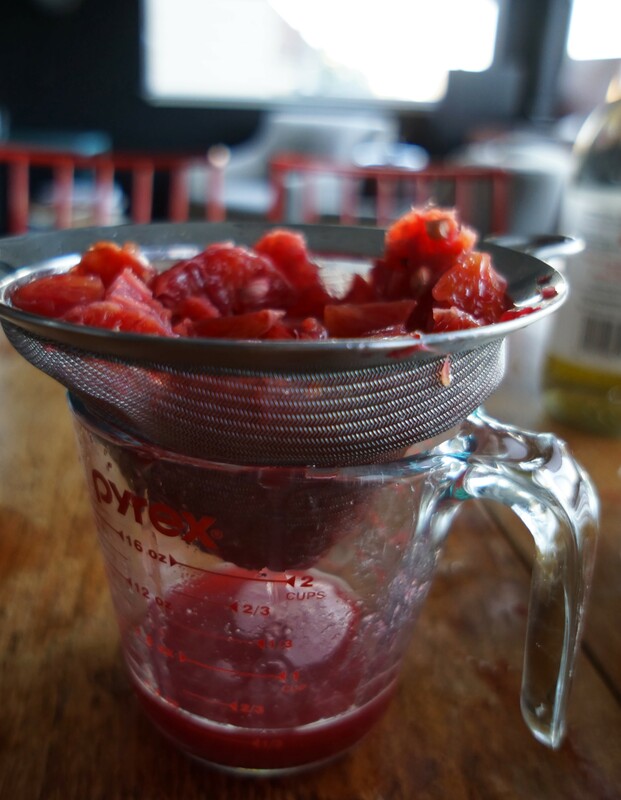 This is the “cold shrub” style of preparation, letting the sugar draw the liquid out of fruit (I came back after a few hours and the bowl was almost full of liquid), which I hear keeps the most clean fruit flavor– the other approach is to cook fruit in sugar and make more of an infused simple syrup. And because any food preservation project also has to turn into a craft project, trying out a few quick label designs (with the usual milk-as-label-glue). I’d initially planned to draw the fruit on the label, but when the shrub itself is so colorful, why hide it? 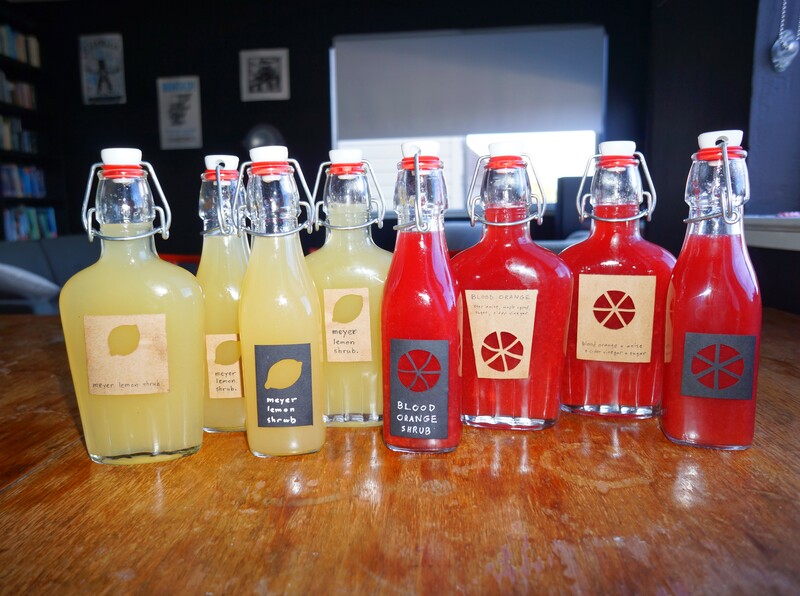 These both turned out quite well, and different– the lemon is great on its own or with soda, the blood orange is probably better in a more robust cocktail or in cooking.